Following the hard-earned victory, I spoke to Sue Burns, who gave the winning pitch. BubbleBum creates a range of award winning travel car booster seats, designed for children aged 4-12 years. Exports are going great! Our core countries include US, Rep Ireland, Netherlands, Denmark and Switzerland. We are keen to expand into mainland Europe further. It enabled us to identify the best market for us to target relative to our resources, strengths and identified where we need extra support. Germany is our target market and we are excited to put our Export Plan into action and grow the market in the short and longer terms. Challenging and thrilling. It was super meeting all of the contestants and hearing about their export experiences and super products. 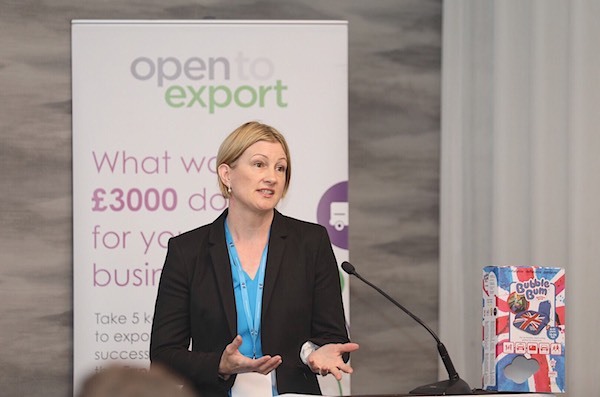 Make as much use of the support available – there is lot of support available including Open to Export, Institute of Export, DIT and fellow exporters – it saves so much time and valuable resources to learn from others. BubbleBum is a specialist manufacturer of the multi award winning BubbleBum inflatable car booster seat range. Founded in 2009 in Northern Ireland by mum of two Grainne Kelly, BubbleBum now helps children travel safely on car journeys all around the world. BubbleBum’s range was designed for use by families with children aged 4-12 years and is approved for use in line with car booster seat legislation for Europe and the US. Families love the range as BubbleBum boosters are safe, and comfy, as well as portable and packable. The seats save families money on renting expensive car seats when on holiday and are ideal for use back home for school runs, compact cars, taxis and safely seating 3 kids on the back seat. When not in use, the seats are light and compact enough to be stored in a glove compartment, handbag, or rucksack. Our global head office is in Northern Ireland, where we now employ a team of 16. Currently we export to 5 key markets, The Republic of Ireland, USA, Denmark, Switzerland and the Netherlands. We have a presence in 28 countries around the world. Our booster seat range is a family travel essential and has won over 20 global awards for innovation, safety and parent approval.